Located only 4 km from Megeve and 30km from Chamonix, in Haute-Savoie, the ski resort of Combloux is a charming village facing Mont Blanc, with a large ski area and a tailor-made welcome for families (Combloux has been labeled “Famille Plus Montagne” since 2005). Combloux, also sometimes called “the Pearl of the Mont Blanc”, is a typically traditional mountain village. You will find well-being, beauty, sports and you are close to Megève, Saint-Gervais and Chamonix. 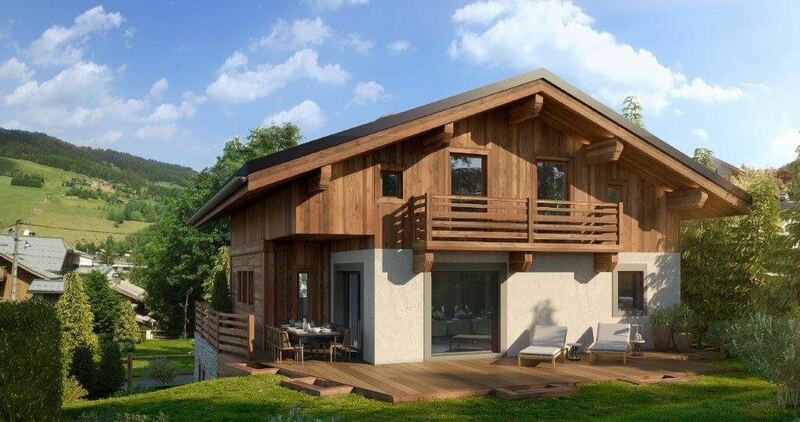 When you buy a ski property in Combloux it is also 1 snow park, 68 pistes, 100kms of pistes and of course direct access to the extensive ski area: Evasion Mont Blanc. With a very easy access, the village is respectful of a traditional architecture (chalets and farms without concrete or large group). It offers a panorama is exceptional, 360 ° on the chains of Mont Blanc, Fiz, Aiguilles Rouges, Aravis. New snow sports enthusiasts also enjoy the Snowboard Area and the Boarder Cross, which are also open to skiers. They can also visit the Giettaz snowpark, which has recently undergone major development in an ecological positioning (wooden modules). The “smallest formula” from Combloux is the ski area of ​​the Portes du Mont-Blanc: 3 sectors connected skis and 1 reached by road (that of Cordon – La Charbonnière). In all, 100 km of slopes, oriented east-north-west, with as many reds as blue and green but few black runs. As far as the ski lifts are concerned, a gondola lift, a dozen chairlifts, twenty ski lifts and two carpets serve the ski area. A hundred snowmakers also ensure good skiing conditions throughout the season. Note that in case of snowfall, the service of the tracks of Combloux allows the greatest number to be tested in powder by not damaging some tracks immediately. An excellent initiative that allows everyone to evolve in powder on marked trails safely. – Combloux sector: north-east exposure, many red slopes, from the top of the Pertuis and Jouty chairlifts, you are at 1757 m altitude. Go back down the Jorace, a beautiful long red trail facing north-west or recover, facing north-east, the Ambourzalles, another red, or the Cross, blue trail in the middle of the firs. Both flank a boarder cross and a snowpark, The Park of the Cross. – Megève / Le Jaillet sector: on the eastern slope, Le Jaillet is located north of the megévane agglomeration and is not connected skis to the feet of the rest of Megève. It has the only gondola Portes du Mont-Blanc which drops you at 1580 m. Two very beautiful slopes go down to the resort: Santa Claus, a blue and the 7 Dwarves, a wonderful green that travels far from the ski lifts. – Sector La Giettaz: from Christomet (1853 m) take the superb blue track La Tréffléannaise for a ride of several kilometers in the middle of conifers, the silence of the mountain and, perhaps even, to see some chamois. On arrival, you are at La Giettaz. Take the two chairlifts Grande Rare and Tête du Torraz to find yourself on the roof of the estate, 1930 m above sea level, and contemplate a landscape 360 ​​° breathtaking: overlooking the Massif Beaufortain, the Avaris and the majestic Mont Blanc. Finally, for those who can not settle for 100 kilometers of slopes, Combloux also offers a larger formula thanks to the Evasion Mont-Blanc package giving access to 445 km of slopes spread over 8 resorts. Lovers of white gold, to your boards! On the area of ​​the Portes du Mont-Blanc, there are 3 snow parks including one in Combloux. – Combloux sector: 2 new-gliding spaces that start at the top of the Plaine Joux ski lift, an 800 m boarder cross for a 150 m drop on the Ambourzalles piste and a snowpark called “La Croix” on the track namesake. – Megève sector / Le Jaillet: a boarder cross located at the top of the 7 dwarfs – Snow White piste accessible by the La Ravine chairlift and the 7 Dwarfs ski lift. – La Giettaz sector: a novelty at La Giettaz, a 900 m long boarder cross, located at the top of the Torraz, next to the snowpark which, for its part, is composed of a beginner park and a park pro. A little green touch on this park which proposes its modules in natural material like wood … For the rail, ramp and halfpipe eaters, a special formula including 2 climbs on the chairlifts Tête du Torraz and Grande Rare + access to the ski lift of the unlimited Torraz is proposed at the day. The toboggan areas are three in number, two on the slopes and one in the heart of the village. For cross-country skiing, the resort of Combloux offers 2 loops (green and blue) for 5.5 km of slopes in balcony on Mont Blanc. The site is appreciated by those who like to hang out, relax an hour or two. The snow is guaranteed until around March 20th. Note that access to the cross-country ski area of ​​Combloux is free for all skiers. Combloux is a typical Haute-Savoie village which in its time was one of the first ski destinations of a small number of elected officials and even became the first municipality in France to take charge of the finances of its lifts. On the heritage side, Combloux proudly displays its Baroque heritage, with the church of Saint Nicolas and its two-storey bulbloid bell tower, one of the rare examples of the region, with a polychrome wooden altarpiece classified in 1967 by the Historical Monuments . You can also discover these treasures by browsing the 20 km of the Baroque Trail, between Combloux and the church of Our Lady of the Gorge Contamines Montjoie that the Comblorans performed each year on Tuesday of Pentecost, as a pilgrimage. With about forty shops and twenty restaurants, Combloux will not offer you two identical evenings. – The view of the Beaufortain massif, the Avaris and the majestic Mont Blanc! – Snowshoeing. Between the Cuchet and the top of the chairlift Ravine or on the ridge that culminates at Christomet (1853 m), snowshoeing routes to practice with a guide are simply incredible. News: the igloo village, snowshoe outing for an hour then dinner under the stars and overnight in an igloo; cani-rackets, a dog sled formula racket – it’s going fast! – Full Moon Trek: collective evening. With your seal skins, magic evening to leave its mark in the powder.